The practice of making a hole in the first floor cooling area with a ring to hold the hop pocket (bag) suspended from it probably started in the 17th Century and continued little changed up to the 19th Century. Lance in 1838 commented that “the process of treading is a tedious and unpleasant work for the men, and occasions great thirst by the quantity of dust that arises, the treader being as yellow all over as a sovereign, and the yellow dust is very choking; the state of their stockings will show the goodness of the hop” p120. Certainly the length of the hop pocket meant that the Bagster, as he was known,would disappear from sight at the start, and the hops would be descending on top of him. Marshall, 1798, reported that it took about 1 hour to fill a pocket. 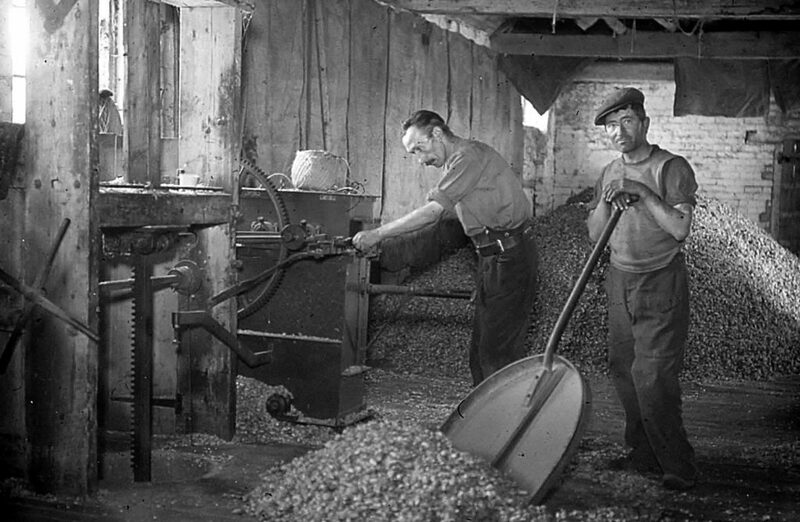 Lance maintains that the bagging and pressing was done in a superior way around Farnham compared to Kent and Sussex where rough bag made by the inmates of Workhouses were used. In Farnham it could take 3-4 hours to fill a hop pocket of 2 cwt, carefully avoiding any air pockets which led to decay.There are a wide range of views amongst writers on how soon to bag the hops; some say as soon as possible, other suggest waiting 2-3 days. Soon after in the mid 19th C cast iron presses with a frame containing a circular ram on cork screw were introduced. 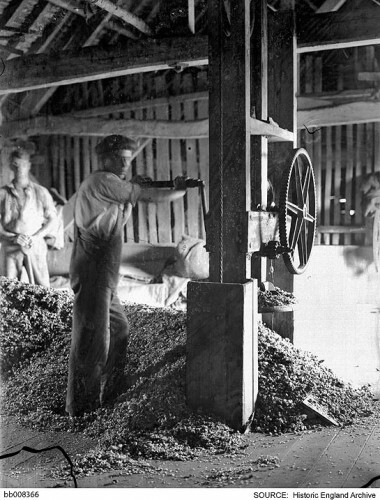 Under both human and mechanical pressing a strong sling was hung from the hole to take weight of the pocket and pressing. A Bramah’s Hydraulic press is recommended by Lance, but probably too expensive for the majority of hop growers. 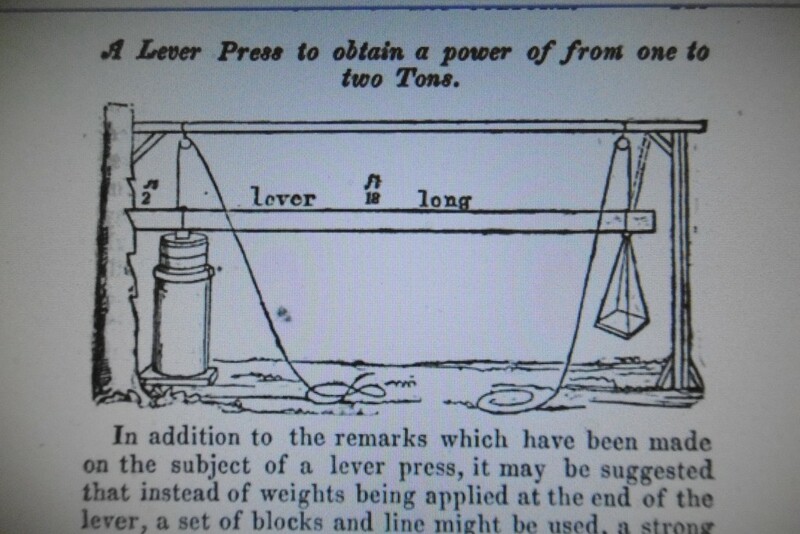 A less expensive option is a lever press (see illustration). 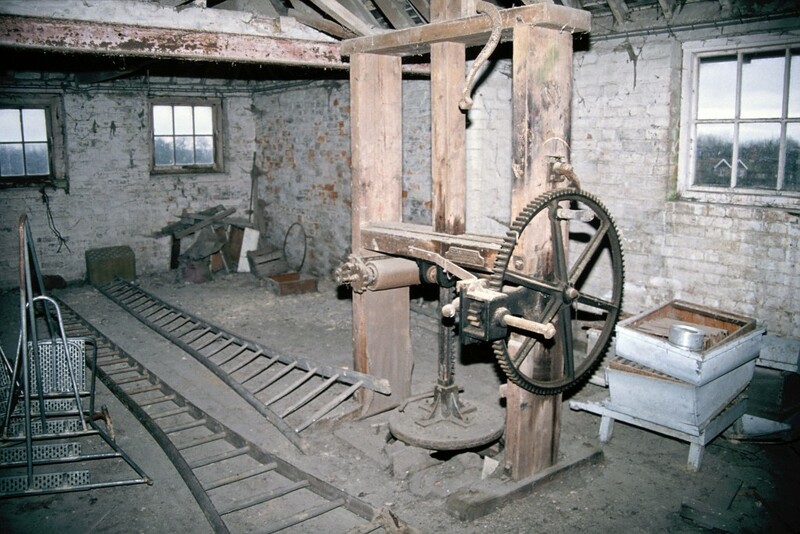 The next advance was a wooden framed press combined with a cast iron rack and winder wheel This was produced William Weekes of Waterside, Maidstone (mid 19thC to 1971) who specialised in machinery for the local hop and fruit business. Later versions were entirely in cast iron, manufactured by Drake and Fletcher of Maidstone (1880s-1970s), Waald of Kent Engineering of Horsemonden and others.